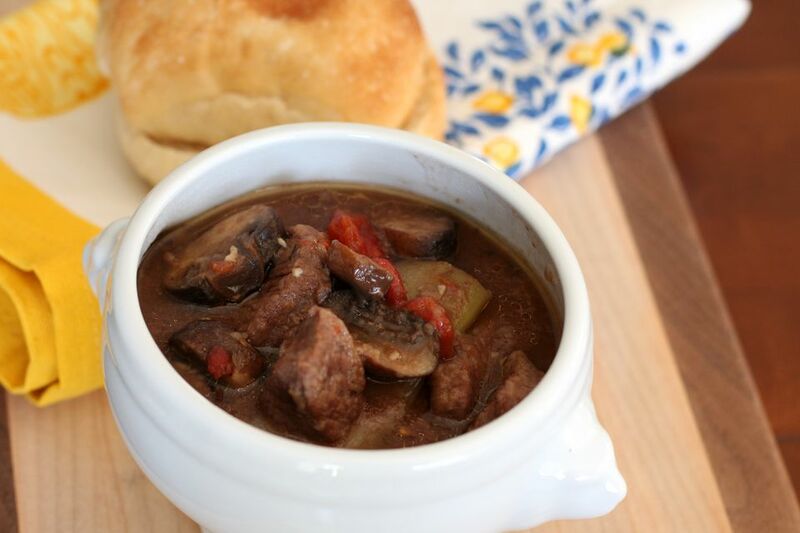 A slow cooker beef stew makes a delicious meal for any day of the week. This version includes plenty of beef along with mushrooms, tomatoes, seasonings, and barbecue sauce for flavor. Feel free to adjust the seasonings to suit your family's tastes. For extra flavor, color, and nutrients, add frozen thawed peas, corn, or green beans about 30 minutes before the stew is ready. Sirloin tips are an excellent option for the stew as well. Serve this beef stew over hot boiled rice, mashed potatoes, polenta, or pasta. Add a salad for a complete, satisfying meal. Cut the beef into bite-size cubes (1/2-inch to 1-inch). Heat the vegetable oil in a skillet over medium-high heat. Cook the beef and onion in the hot oil until beef is browned on all sides, stirring constantly. Reduce the heat to medium. Add the garlic and chopped green pepper and cook for 1 minute longer. Transfer the beef mixture to the slow cooker. Add the salt, pepper, beef stock, tomatoes, mushrooms, and barbecue sauce. Cover and cook on low for about 7 to 9 hours, or until the beef is very tender. Mix 2 tablespoons of cornstarch with the cold water until smooth and well blended. Stir the cornstarch slurry stir into ​the stew and continue to cook for 10 to 20 minutes, or until thickened..